In the early twentieth century, the new technology of flight changed warfare irrevocably, not only on the battlefield, but also on the home front. As prophesied before 1914, Britain in the First World War was effectively no longer an island, with its cities attacked by Zeppelin airships and Gotha bombers in one of the first strategic bombing campaigns. Drawing on prewar ideas about the fragility of modern industrial civilization, some writers now began to argue that the main strategic risk to Britain was not invasion or blockade, but the possibility of a sudden and intense aerial bombardment of London and other cities, which would cause tremendous destruction and massive casualties. The nation would be shattered in a matter of days or weeks, before it could fully mobilize for war. Defeat, decline, and perhaps even extinction, would follow. This theory of the knock-out blow from the air solidified into a consensus during the 1920s and by the 1930s had largely become an orthodoxy, accepted by pacifists and militarists alike. But the devastation feared in 1938 during the Munich Crisis, when gas masks were distributed and hundreds of thousands fled London, was far in excess of the damage wrought by the Luftwaffe during the Blitz in 1940 and 1941, as terrible as that was. The knock-out blow, then, was a myth. But it was a myth with consequences. 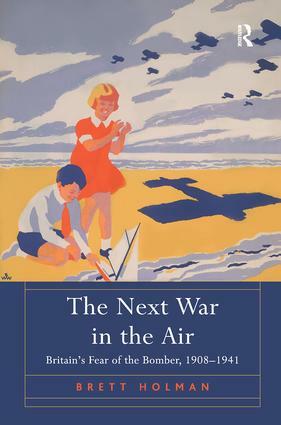 For the first time, The Next War in the Air reconstructs the concept of the knock-out blow as it was articulated in the public sphere, the reasons why it came to be so widely accepted by both experts and non-experts, and the way it shaped the responses of the British public to some of the great issues facing them in the 1930s, from pacifism to fascism. Drawing on both archival documents and fictional and non-fictional publications from the period between 1908, when aviation was first perceived as a threat to British security, and 1941, when the Blitz ended, and it became clear that no knock-out blow was coming, The Next War in the Air provides a fascinating insight into the origins and evolution of this important cultural and intellectual phenomenon, Britain's fear of the bomber. Contents: Introduction; Part I Threats: Constructing the knock-out blow, 1908-1931;The bomber ascendant, 1932-1941. Part II Responses: Living with the bomber: adaptation; The only defence is in offence: resistance; Wings over the world: negotiation. Part III Crises: Defence panics and air panics; The German air menace: 1913, 1922 and 1935; Barcelona, Canton and London: 1938; The Battles of London: 1917 and 1940; Conclusion; Bibliography; Index. Dr Brett Holman is lecturer in Modern European History in the School of Humanities at the University of New England, Armidale, Australia. He was awarded a PhD by the School of Historical Studies at the University of Melbourne. His research interests revolve around the place of aviation in British society and culture in the first half of the twentieth century. Primarily this means trying to understand how people responded to the threat of strategic bombing, the fabled 'knock-out blow from the air'. He is the author of several peer-reviewed publications, including articles on liberal internationalism and the international air force, the air panic of 1935, the reprisals debate during the Blitz, the convertibility of airliners into bombers, and most recently the Australian mystery aeroplane scare of 1918. Before becoming an academic, Dr Holman worked in IT at the University of Melbourne. Previously, he trained as an astrophysicist, obtaining a Master of Science by research from the School of Physics at the University of Melbourne in 1998.